Sir Noel Mobbs, Lord of the Manor of Stoke Poges, acquired twenty acres to the south side of St Giles’ Church in Stoke Poges to leave as a Memorial Garden that would be a ‘living memorial to the dead and of solace to the bereaved’. The gardens were designed by Edward White, and their main feature is a colonnaded central parterre garden, reached by a central path leading from the Church Cottage. Secondary paths extend at right angles from this, linking with the circuitous paths around the perimeter, where woodland areas lead naturally into the surrounding parkland. There is an avenue along the eastern boundary bordering the lake and Stoke Park that was laid out by ‘Capability’ Brpwn, and later improved by Humphry Repton, who added the imposing three-arched bridge over the lake in front of the Mansion. All the evidence indicates that White commissioned James Pulham and Son to construct these gardens to his plans, and this was probably the last major landscaping project undertaken by the firm. There is a small central pool and fountain in the centre of the sunken parterre garden, which is totally encircled by a colonnaded pergola. Another very large fountain stands in an adjacent part of the gardens, and this is likely to have come from the Broxbourne manufactory. 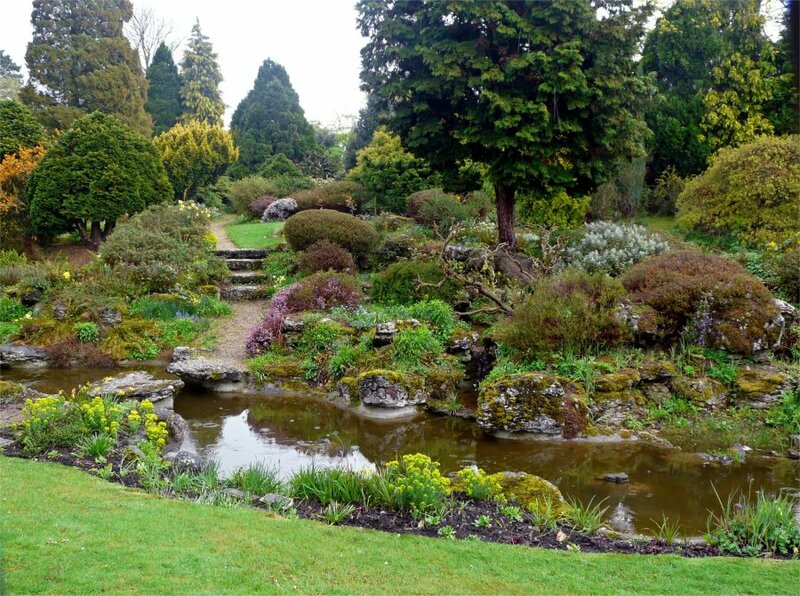 Around the boundary of the formal gardens, bordering the lake in Stoke Park, there is a charming, winding rocky stream, complete with a small cascade, rocky banks, steps and stepping-stones. The passage of time and the effects of severe weather took their inevitable toll over the years, but English Heritage registered them as Grade II listed, and, in 2001, the Heritage Lottery Fund contributed half of their £1million restoration costs. They are the only known example of a Memorial Garden in this country. A full description of the work done by James Pulham and Son at the Stoke Poges Memorial Gardens – together with a number of pictures – can be found in Chapter 42 of Rock Landscapes: The Pulham Legacy – the critically-acclaimed and lavishly illustrated definitive story of the lives and work of James Pulham and Son. Written by Claude Hitching, with featured photography by Jenny Lilly. Published by Garden Art Press. Posted on October 14, 2014 June 30, 2016 by Claude HitchingPosted in Book ContentsTagged 'capability' brown, . . James Pulham and Son, Claude Hitching, Colonnaded parterre, edward white, English Heritage, Heritage Lottery Fund, Humphry Repton, Rock Landscapes: The Pulham Legacy, Sir Noel Mobbs, Stoke Poges Memorial Gardens.